Just when you thought that we did not have to worry about a college coach jumping to the NBA, Billy Donovan stated that he won’t guarantee that he will be back at Florida next season. On the surface, it is a fairly innocuous statement, but given the number of job openings out there and the fact that Donovan has already stated that several NBA teams have been in contact with him it will probably raise a few eyebrows in Gainesville. Donovan is already making $3.7 million per year at Florida over the next seasons after signing a contract extension in February so we don’t think he will be able to parlay this into a much bigger salary particularly at Florida, but it will be something to keep an eye on. Based on the current openings we would have to assume his most likely options would be Cleveland, Utah, and Minnesota because we cannot see the Lakers (read: Kobe) or the Knicks (read: Phil) handing over the keys to a college coach they don’t know. It seems like we just finished up with the recruiting class of 2014 finalizing their destinations and we are already starting to have to deal with news surrounding the class of 2015 and possibly 2016. According to Evan Daniels, there is a chance that Thon Maker (the #1 player in the class of 2016) might reclassify to the class of 2015. According to Maker’s legal guardian the decision on reclassifying will depend on how Maker is doing academically and physically (adding on weight). If Maker does reclassify, he will almost certainly be a top-five player in the class as he already has Arizona, Duke, Kansas, Kentucky, and Louisville pursuing him. To some people, any time a job opens up at a BCS level school the media is quick to tout it as a big opening and one that could be potentially career-altering for the right candidate. Myron Medcalf is not so sure and thinks that some of these jobs are much less desirable than you may think. While we agree with him that not all BCS-level jobs are created equal we do have some issues with the ones that he picked. None of the schools listed would be considered among the nation’s elite programs, but some of them–particularly UNLV and FSU–are actually pretty desirable in our eyes. Overall many of the programs listed do have quite a few issues that limit them, but we don’t think that would prevent us from jumping at an opportunity here particularly if we were a mid-major coach trying to move up a level. If we were a hot college assistant we might have second thoughts about taking one of these as our first job if other options were available although some coaches in such a position have already done so. Maryland is not the only major program that is experiencing a mass (transfer) exodus. 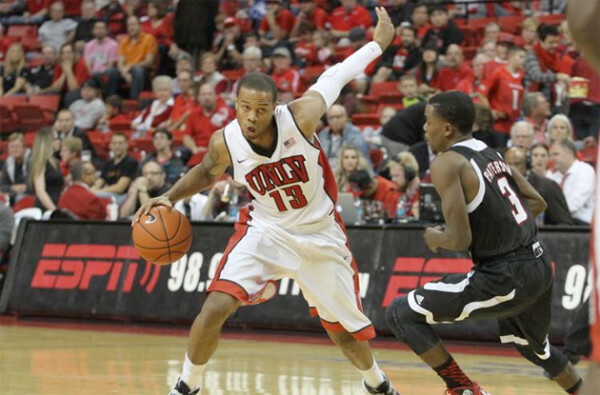 UNLV is experiencing its own crisis as Deville Smith announced that he will be transferring for his senior season. 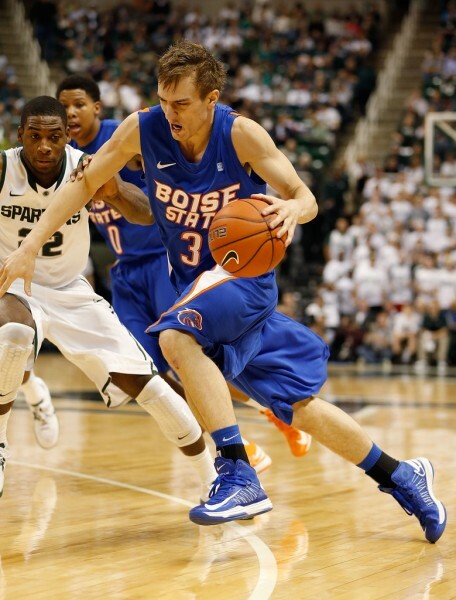 Smith was the team’s starting point guard last season averaging 9.7 points and 2.7 assists per game. He is the third Rebel to transfer this off-season joining Bryce Dejean-Jones (the team’s leading scorer; headed to Iowa State) and Demetris Morant (headed to Florida Gulf Coast). When you combine that with Khem Birch and Roscoe Smith declaring early for the NBA Draft, the Rebels have lost their top five scorers from this past season, which will make the Rebels a completely different team next season even if their drop-off in performance might not be as high as you would expect given their impressive incoming freshman class. When looking back at college basketball history, we often tend to overlook many significant individuals simply because they were not at big-name programs. Legendary coach Don Meyer is one example of that, but the outpouring for his funeral in South Dakota on Saturday–several thousand people attended–should be a clear indicator of the impact he had not only on the game, but beyond the court too. Meyer compiled a 923-324 record during his 38-year career of which only four were losing seasons. Meyer is best known for his time at Lipscomb where he was 665-179 between 1985 and 1999. A second service for Meyer will be held at Lipscomb on June 1. RTC Mountain West correspondent Andrew Murawa and national columnist Bennet Hayes will both be in Las Vegas this week for coverage of the Mountain West Tournament. San Diego State and New Mexico appear to be on a crash course for a third and final meeting in the tournament final, but there are plenty of questions worth asking before play kicks off on Wednesday afternoon. Murawa and Hayes weigh in below on four of the most pressing. Which is the most dangerous team outside of New Mexico and San Diego State? Could “Khem Kong” And A Raucous Thomas And Mack Center Crowd Propel UNLV To An Unexpected Mountain West Tournament Run? 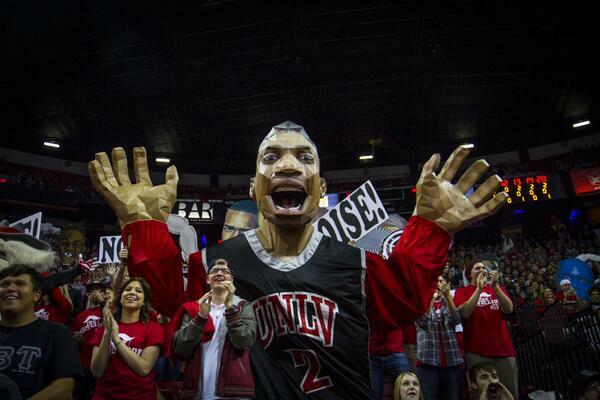 AM: UNLV. Well, I jumped the gun and got my answers in first, so while Bennet gets stuck having to make a case for someone besides UNLV, I get to tell you why the Runnin’ Rebels – you know, the team playing the Mountain West tournament on its own home floor – has the best chance to win this thing. And honestly, even if they weren’t playing at the Thomas & Mack, the Rebels would still be my pick, even if they’re still something of a longshot compared to the two favorites. They’ve been inconsistent all year, and that isn’t going to change, but in Bryce Dejean-Jones and Deville Smith, they’ve got offensive firepower, and in Khem Birch and Roscoe Smith, they’ve got the hard-working defensive grinders in place. This team should have been better than it was this year and the conference tournament would be a good place for Dave Rice’s crew to turn things around. For what it’s worth, UNLV has won the MW tournament three times at the Thomas & Mack, but the most recent is six years ago; maybe they’re due? 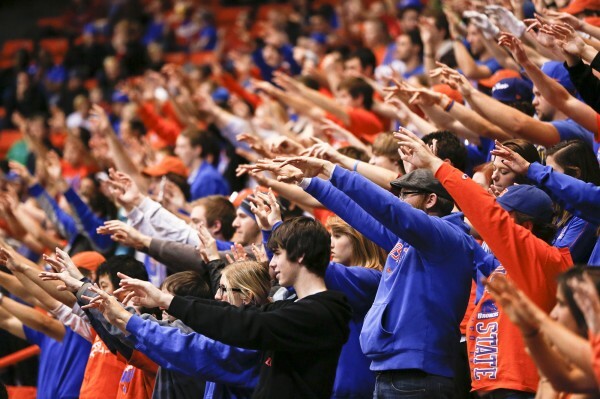 BH: Boise State. In all likelihood, to win the Mountain West title this week, you will have to beat both New Mexico and San Diego State. No team was able to accomplish that feat in the regular season, but if there’s a team in Vegas capable of doing it, it’s the Broncos. They split with New Mexico in the regular season (winning in Boise) and lost two games to the Aztecs by a total of five points, so don’t let their 9-9 conference record fool you – this team can compete with anyone in the MW. Of course, they’ve proven capable of losing to almost anyone in the conference as well (see: Saturday against Air Force), but Las Vegas offers Boise a chance at a clean slate. Four wins in Vegas would go a long ways towards erasing the disappointment of a season that began with high hopes. This week in the Mountain West conference had it all: a much-awaited Top 25 match-up between the two teams remaining in the race for the conference title; an epic (game of the year?) overtime battle between what appears to be the third- and fourth-best teams in the conference that went down to, literally, the final split second before some postgame controversy; and straight heartbreak, when an all-conference performer had his season abruptly ended by injury. Let’s get right to it. 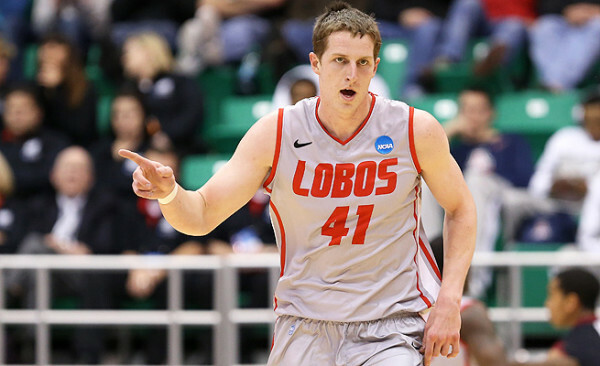 New Mexico – A little patience, plenty of hard work and steady improvement, and the Lobos are back where their fans expected them to be all along – in first place in the conference. After going on the road and handling the Runnin’ Rebels with relative ease, Craig Neal and company returned home and, in front of a raucous home crowd, showed San Diego State that there is at least another team in the conference capable of some lockdown defense on occasion. Inside the Top 25 and tied atop the conference standings, the Lobos seem to be peaking at just the right time. After the slowdown around the holidays, the Mountain West is back in full swing. Conference play is underway; everybody has played at least one game against a conference opponent; and San Diego State ended non-conference play on a big high, scoring a thoroughly impressive win at Kansas over the weekend. There’s a lot to get to, so let’s jump right in, after recognizing that right now we have Air Force and Nevada – two teams we have been making fun of all season – tied atop the conference standings with 2-0 records. 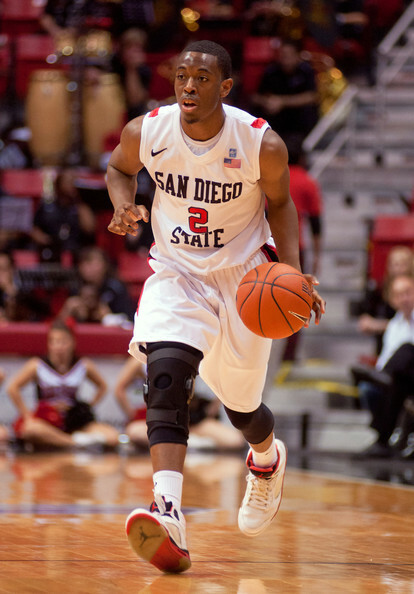 San Diego State – The Aztecs got conference play underway well by going on the road to Colorado State, getting a good early start, and then maintaining a solid lead the rest of the way. Then on Sunday, they capped off a dream day for San Diego sports fans, backing up the Chargers’ playoff win with a win of their own at Allen Fieldhouse. They’re not a perfect team, but this squad likes each other, works exceedingly well together, and Steve Fisher is getting every last drop out of it in what is turning out to be yet another masterful coaching job. While we maybe have been a step behind on fully believing in this team, those days are over; the Aztecs are the clear favorite in the Mountain West. Out of the country? Living under a rock? 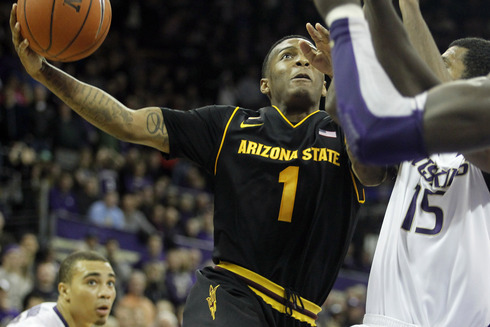 Here’s what you missed in the second week of Pac-12 basketball. Best Game – Arizona State @ UNLV: In a week where Harvard-Colorado was probably the second best Pac-12 game, Arizona State and UNLV provided greater drama. Intensity was high from the outset as both teams battled back and forth in the first 20 minutes. Neither team led by more than four points in the first half, and that was the margin when junior Deville Smith hit a jumper as time expired to put UNLV up by a score of 38-34. The crowd of over 12,000 was quieted with about five minutes remaining when the Sun Devils went on a critical 8-2 run to lead by seven, and Jahii Carson made sure the Devils stayed in front with a clutch jumper and two key free throws. When all was said and done, Carson had finished with 40 points and seven assists, a performance you may not see topped this year in conference play, and Arizona State left the Thomas & Mack Center with an 86-80 win to remain undefeated. The 5’10” sophomore also made 14 of his 16 buckets from the field at the rim, a ridiculous stat for someone of his stature. By virtue of a loss at LSU, CBSSports.com special contributor Jerry Palm placed Arkansas as one of his “Weekend Losers” as the Razorbacks fell to 0-6 on the road. Arkansas has only one more road game against a top-100 opponent, its season finale at Mississippi State, but they can get off the schneid on Wednesday in Athens against Georiga.